Iv been staying with my parents this week as it is Half term here. I quite enjoy wandering around the charity shops with my mum and often come out with some amazing bits. I haven't taken photographs of EVERYTHING as I really didn't want to bore you all. I brought a large box full of buttons. 15 Zips. some old patterns (most never used) several sewing books. lace, beads, buckles, pop studs, brooches. I also brought a large pile of old fabrics, some table clothes, some bed spreads and others just old cuts that have never even been used. This is my most favorite thing I have found in a charity shop in ages. Thought it was perfect to photograph in front of my WIP my grandmother's garden quilt. 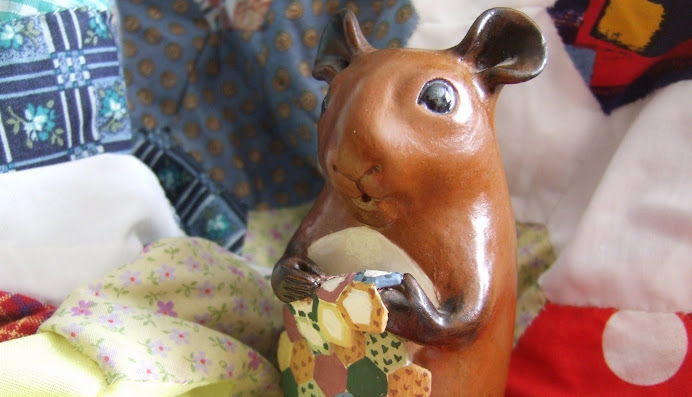 I Love that this mouse is doing the patchwork. If you look really closely the mouse also has a little tiny needle and thread to help her do this. I adore the way the tail curls up around her body. So tell me do you go charity shopping / thrift shop shopping??? What is the best find you have found??? My partner finally recieved her block today, so I can post about this. It took me ages to ponder over what I was wanting to do for my partner. I had plenty of initial thoughts, but nothing quite seemed to fit my Partner. Getting to know her a bit better I finally decided on this one. If you look really closely you will notice there are tiny little hearts on the red fabrics, I thought my partner might think I was crazy including a "this way up" sign, but Im sure she understood the reason for it!! Took me ages but Im sure this perfectly suits my partner. Fingers crossed mine will arrive soon as they were posted on similar days. I just don't understand the amount of flights etc across the big pond why it always seems to take sooo long for post to arrive. Oh well the wait will surely soon be over. Well this week I am lucky enough to have another follower this week!!! WAHOOO!! That brings my followers up to 3! lol. Check out Evelyn's blog shes a very talented knitter, makes very cute baby things with a very gorgous family with 3 adorable cuties!!!!! Very jealous, wish I could knit as well as she can!! Well progress for me this week, I have 2 very similar projects going on at the moment, both I plan to be christmas gifts, but not giving full details away at the moment because Im sure the person these gifts are for is reading this at some point!!!! These strips were a real bargain at my local quilting shop!! can you believe I got over twice the amount in all these photo's for only £2!!!!!!! I had to go back a few days later and clear out their basket full, got plenty of ideas for these. This one has a very christmassy theme and I plan for it to only be used during this time of the year. The other a much more all round theme (with any luck I might actually get this one finished for someone's birthday but I have a few months for that yet!!! I aim to be making a few little gifts for people at work as I am leaving in 15 days, its sad to be going but I have an absolutely amazing job to go to!!! So good and bad points soming up soon!! Hope to show you my creations at some point again soon, as those of you as lucky as me to have a week break this week enjoy what ever you are doing! I needed one of those bags for carrying odds and ends in the bottom of your hand bag. This was the creation I came up with, based very much on the similar pattern as my pencil case . Totally made out of recycled fabrics and selvedges. It tickled me and I didn't realise until afterwards about the selvedge that I chose for this bag. I find it quite funny I wanted this big enough to take Paracetamols and vaseline etc. and its a Quilt for a cure! lol. I love these colours and think they work well together. Lots of work at uni at the moment, but its half term next week. Got one or 2 more WIP's to show you over the next few days and hopefully by next weekend one of those WIP's will be finished!!! What are you up to at the moment??? I made this for a group of low ability year 9 pupils that I am currently teaching in my placement school. The project is cushions, based around "make do and mend" to a particular theme of their fancy. I really wanted them to think about cushions of different shapes etc. I found this in a magazine for a soft toy which was slightly too small so blew it up on the photocopier to make it large enough to make a cute cushion. The kids absolutely loved it! and it really inspired them to think outside the box as well!!! Not sure if I shared this information with you before, but Im part of the quilt block swap. I get really excited at the begining of every month to find out who my partner is and make exciting blocks for them. Unfortunatly due to my excitement with my job interviews etc I never got round to blogging about this one. Really sorry about this Angela, this block is absolutely amazing, and Im really sorry the photograph doesn't really do it justice!! I promise you it didn't arrive this screwed up. I'm looking forward to collecting these over the next few months and making myself a gorgeous bed quilt for my first house I plan on buying in 12 months(ish) time! It would be absolutely amazing to say this quilt was made all over the world especially by me, and know that as much love and care was put into them as there was into the squares I made for others. Well its been ages since I last posted anything. So quick up date. I have a brand new job, is absolutely perfect and I get a house with it as well. Can't wait to start but Have to wait until September, its at an amazing school in Essex. Working with a very friendly team. And I have even had the opportunity to meet one of my classes already!!! Im so pleased. Unfortunatly this means I haven't had quite as much time as I would have liked on quilting projects but I do have several new projects to post about, but unfortunately I dont have time to right now, as soon as I do I will let you all know. I have been teaching my year 9 (14 year Old) pupils how to do patchwork and quilting. Hoping to get them as "quilt-fingered" (just like green fingered but for quilts) as I am. I will try and get photographs of their efforts to post here once they have finished. So just as long as you are all sure Im still alive. Sorry for the lack of posting at the moment. This is only a really quick one. I have not been able to post for a while as I am currently on a job hunt. The deadline for teaching jobs is in the next few weeks so I have been working extra hard recently in preparation for the job interviews that I have recieved. Sorry crafters of the world I will be updating you soon..